" The New New Painters" are a group of artists brought together by a mutual understanding of art. Although each artist has their own style and techniques, the basic concept is about abstraction and investigating all the possibilities, using new acrylic materials and paints. Many of the artists have shown together since the early eighties, and in some cases even earlier. Irene Neal has been a member of this international group of artists since 1982. This group has had more than 55 international shows together. The artists currently showing together are Lucy Baker, Steve Brent, Joseph Drapell, Roy Lerner, Marjorie Minkin, Irene Neal, Graham Peacock, Bruce Piermarini, Jerald Webster, Bill Kort, Zino Peci, Peter G-Ray and Ben Woolfitt. Lucy Baker was the founder of the Boston Painters and Sculptors in 1978. Baker and four members of this original group formed the core of the New New Painters. Kenworth W. Moffett, then curator at the Boston Museum of Fine Arts, was supportive of the group from its inception and continues to write and curate shows, culminating in rating the 69th Regiment Armory Show of 2000 in New York City. It was a huge exhibition with over 240 works and a color catalog. In the "New New Painting" show at the Galerie Gerald Piltzer, Paris, France (1996) also included were French artist Gerald Paire and the German artist Bernhard Walz who share a kinship with their American and Canadian counterparts. Other artists who have shown with the New New Painters are the American sculptor, Tom Fertig, the Belgian painter Bram Bogart and the Portuguese painter Eduardo da Rosa. 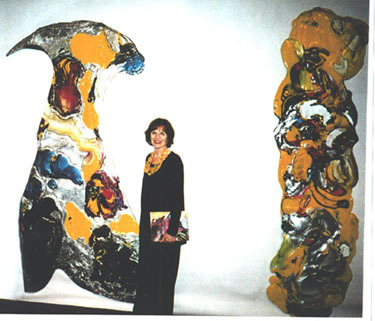 Irene Neal at the "New New Painters 69th Regiment Armory Show 2000" standing next to "To An Angel" and "Song of the Soul (Spring)".